Jean Paul Marat was a leader of the Cordeliers Club (a radical group in France) along with Georges Danton. He was assassinated in 1793 by a young Girondist named Charlotte Corday, who believed that his death would end the French Revolution. Like most of the people involved in the French Revolution, he was a huge follower of Jean-Jacques Rousseau, even adopting a disheveled and unbathed appearance specifically to "live simply and according to the precepts of [Rousseau]." In addition, he wrote the newsletter L'Ami du Peuple (Friend of the People), which was known to incite radical and dangerous behavior, such as encouraging the "people" to attack its enemies. Because of this as well as a similar newsletter written by René Hébert, Le Père Duchesne (Old Man Duchesne/Father Duchesne), Marat and his ilk played key roles in what Miguel A. Faria, Jr. referred to as the "scissors strategy", where totalitarian dictatorships often had on the bottom half deranged mobs threatening everyone to expand government or die, and the heads of state representing the revolutionaries making similar radical demands (with Hebert in particular representing the former). Marat was part of a planned line of statues, the Monumental Propaganda, commemorating various other French Revolutionary figures such as Maximilien de Robespierre, Georges Danton and François-Noël Babeuf, that were to be made shortly after the October Revolution in Russia. However, his statue was never completed. 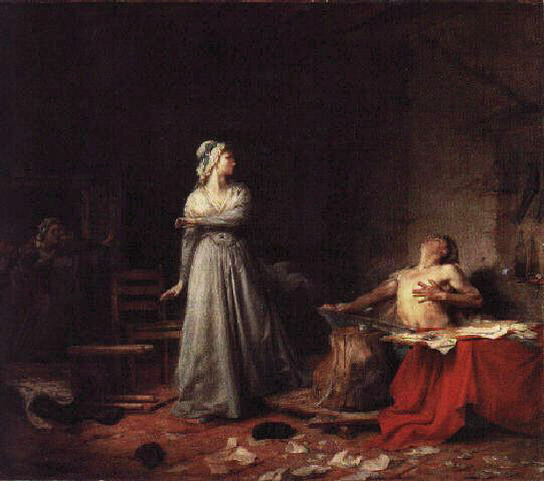 La muerte de Marat by Santiago Rebull. This page was last modified on 28 February 2019, at 19:03. This page has been accessed 13,809 times.